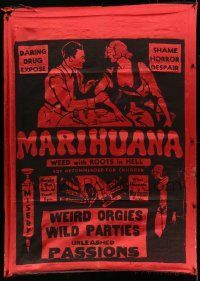 6w110 MARIHUANA silk banner '35 Dwain Esper daring drug expose, The Weed with Roots in Hell, rare! Important Added Info: Note that we can't say for certain that this silk banner is from the 1935 first release of this movie, but it would certainly seem likely, because we would doubt they would make such an elaborate item for a re-release! We would think it is extremely unlikely that another one of these survived! If anyone knows more about this banner, please e-mail us and we will post it here. Note that we auctioned this very same silk banner 4 years ago, and our consignor is the person who purchased it then, and as far as we know, this is the ONLY existing example of this silk banner!